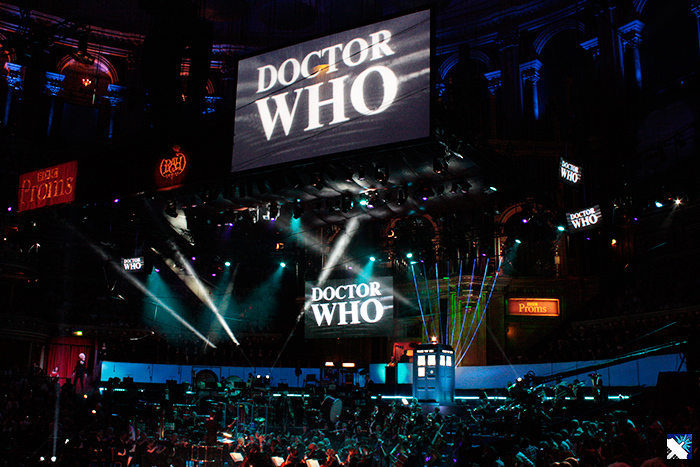 On Saturday 13th July, DWO were invited to attend the 2013 Doctor Who Prom at the Royal Albert Hall - and what a show it was! The venue was packed to the rafters, with a large number of hopeful fans queuing up all day for a standing-room-only ticket raffle - true dedication! 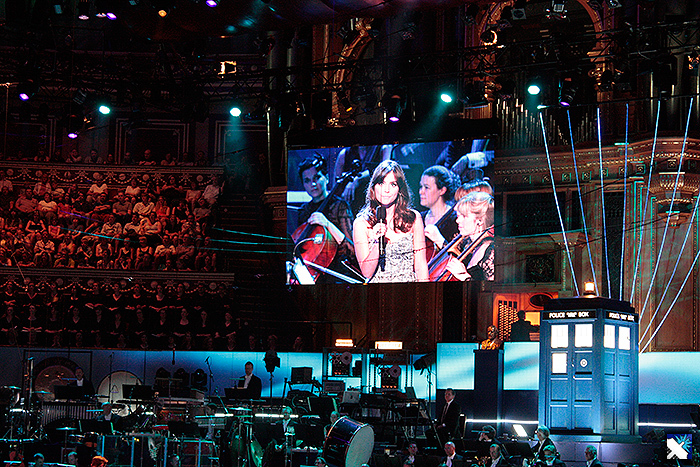 From where we were sitting, we could clearly see the TARDIS on stage, emanating a familiar, welcoming blue glow, and numerous screens covered areas of the hall to ensure no-one missed a thing. 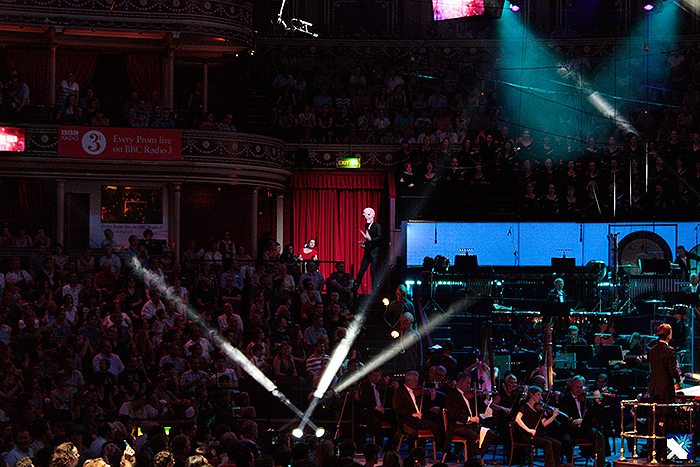 The show kicked off with Ben Foster (Conductor) entering the stage to rapturous applause, followed by Elin Manahan Thomas (Soprano) as they performed Murray Gold's 'The Mad Man with a Box'. After a brief pause for some well-deserved applause, we went straight into the second piece for the evening; Gold's 'I Am The Doctor'. 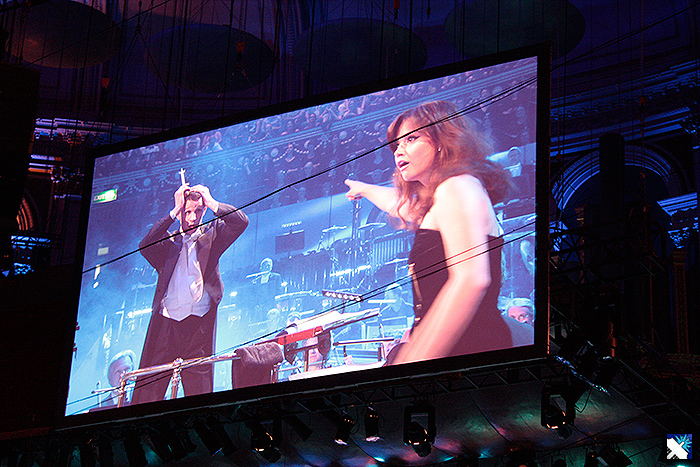 We were then treated to a video link of a specially recorded scene featuring Matt Smith as The Doctor and Jenna-Louise Coleman as Clara. 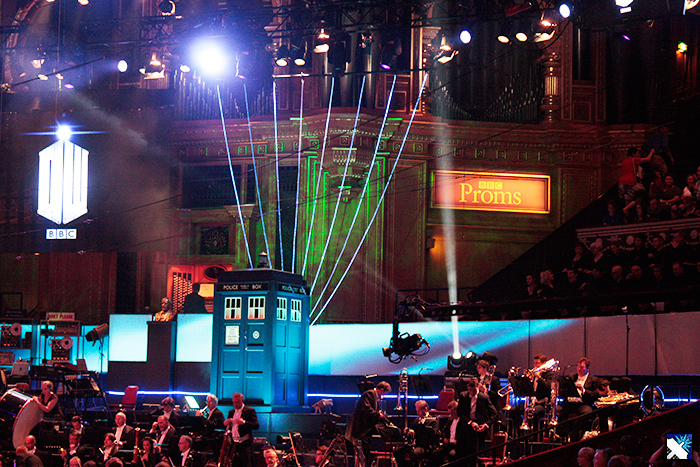 The comical scene found The Doctor trying to swap places with two people inside the Albert Hall in order to attend the prom. 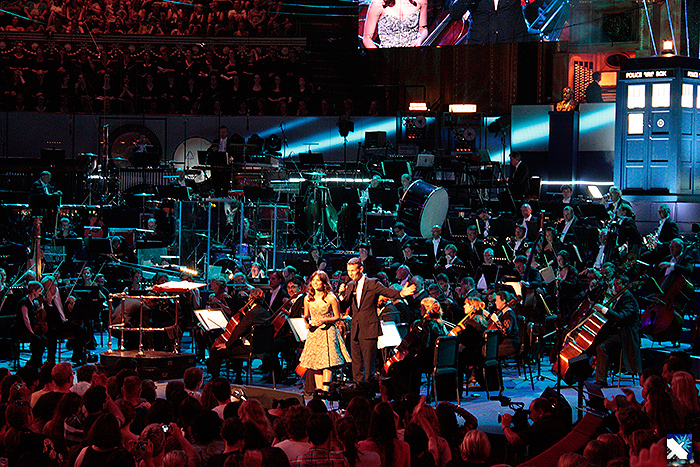 As the scene came to an end, the action switched back inside the hall to thunderous applause as Matt and Jenna appeared from the Orchestra pit. There was also a clever little explanation as to why Matt's hair was short - but we'll leave that for the televised version! Also worthy of note at this point, was a special gift given to Foster by The Doctor - a sonic baton, to which Foster used with precision throughout the entire prom. The third piece of music for the evening was 'Carmen (Suite No.2) - Habanera' by George Bizet. There were a couple of puzzled faces sitting around us with some of the younger audience members, until Matt pointed out the music was used in the Series 7 story 'Asylum Of The Daleks' before looking at Jenna and claiming "last time we heard it, you were a Dalek!" The fourth choice for the evening was introduced by Madame Vastra (Neve McIntosh) and Strax (Dan Starkey), featuring a medley of Murray Gold's music titled 'The Companions', with extended versions of their respective themes in chronological order. Elin Manahan Thomas joined the stage again for the relevant sections. 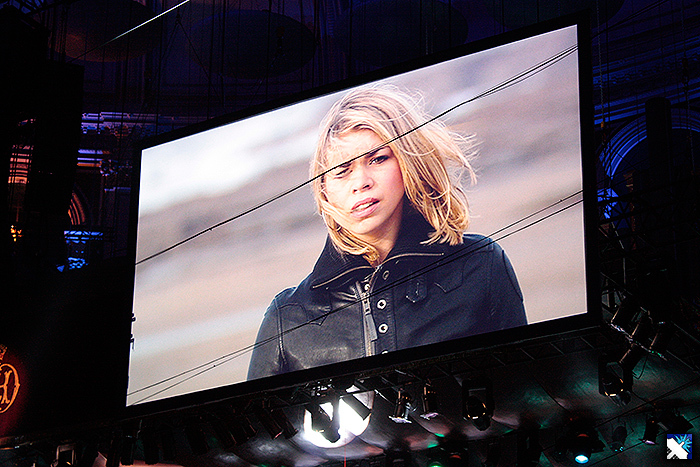 It was rather moving in places as the screens played out some of the pivotal moments from each of the New Series companions' eras, through the heart-wrenching climax of Rose Tyler's era, to Martha Jones, Donna Noble and finally Amy Pond. 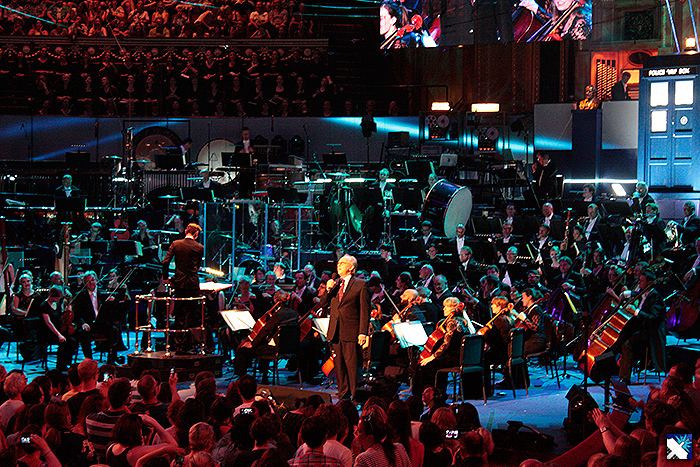 The fifth segment of music 'Cyber Shard' was introduced by Strax in one of his 'field reports', and garnered some laughs from the audience with his gentle digs at humans "resting their weak and feeble bodies in seats". As the title suggests, this pieces of music focused on the Cybermen. 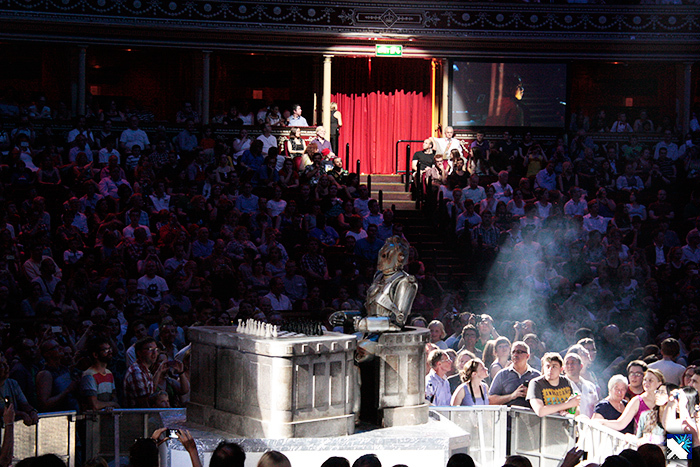 Near the centre of the hall, was a Cyberman with a portion of the set from Neil Gaiman's recent Doctor Who episode 'Nightmare In Silver', in which a lonesome Cyberman sits in a chair playing chess, re-enacting the actual events on screen from the episode itself. 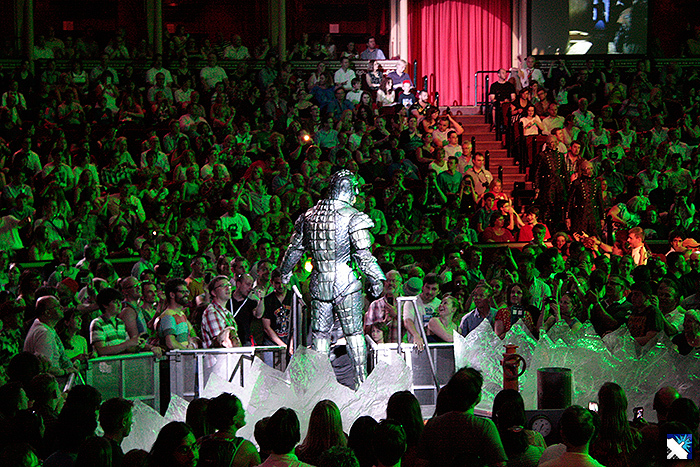 Cybermen then filled the Royal Albert Hall from the various entrances, infiltrating the audience with shrieks and screams. Up next was the sixth piece of music - once again introduced by Vastra and Strax; 'Tocatta and Fugue in D minor, BWV 565 - excerpt' by Johann Sebastian Bach and orchestrated by Leopold Stokowski. 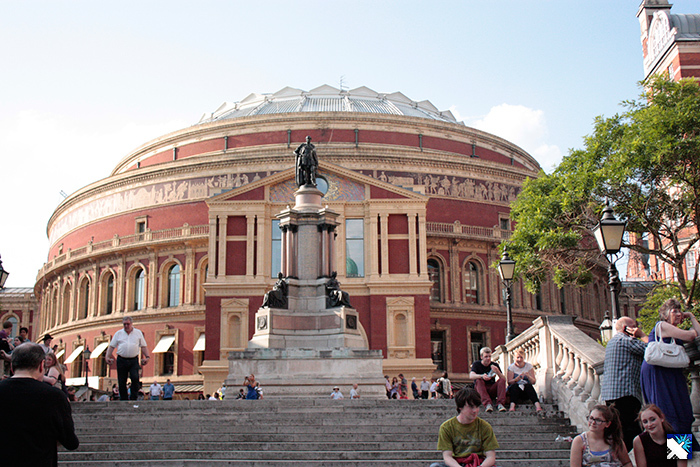 Interestingly, the piece didn't make use of the Royal Albert Hall's famous organ - an instrument which popular culture has grown to associate with this particular musical composition. This was definitely one for the Classic Series fans as it featured, albeit briefly, in The 6th Doctor story 'Attack Of The Cybermen'. 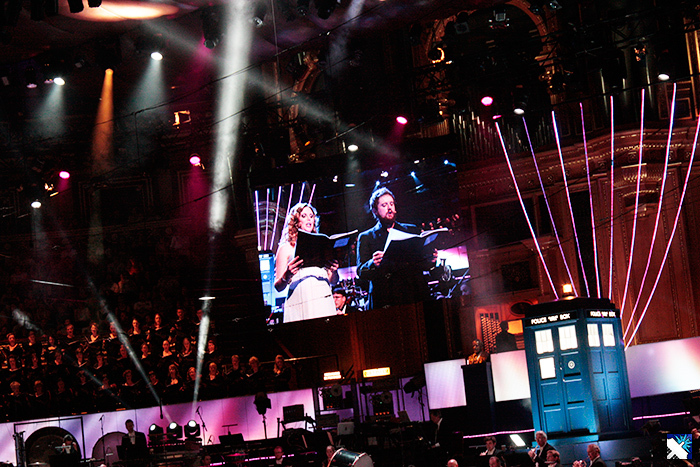 This then lead into 'The Final Chapter of Amelia Pond' by Murray Gold, with Elin Manahan Thomas once again joining the stage, as a Weeping Angel rose up from the centre of the hall as a fixed touchstone throughout the piece. The climax of this composition was quite moving as we relived the moments that Rory and Amy are taken from their time streams by the Weeping Angels, leaving a heart-broken Doctor. 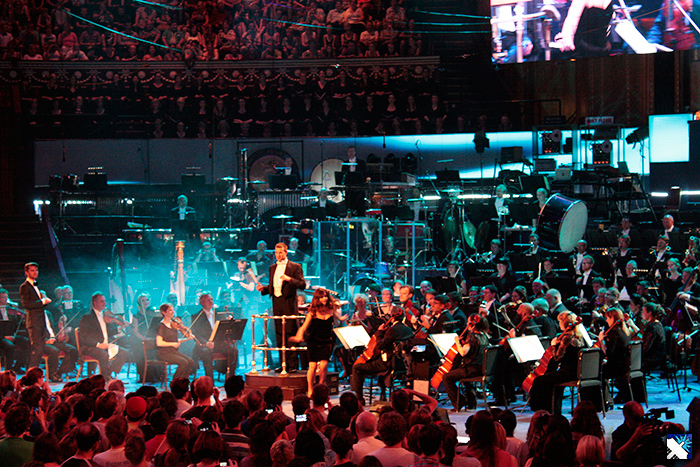 To round off the first half of the Doctor Who prom, we were treated to Gold's anthemic 'The Rings Of Akhaten', featuring the voices of Kerry Ingram and Allan Clayton - backed by the London Philharmonic Choir. Vastra and Strax introduced the piece, explaining the departure of the Ponds and the introduction of Clara. After a 20 minute interval we were thrown right back into the action as Gold's 'All The Strange, Strange Creatures' kicked off the closing act. 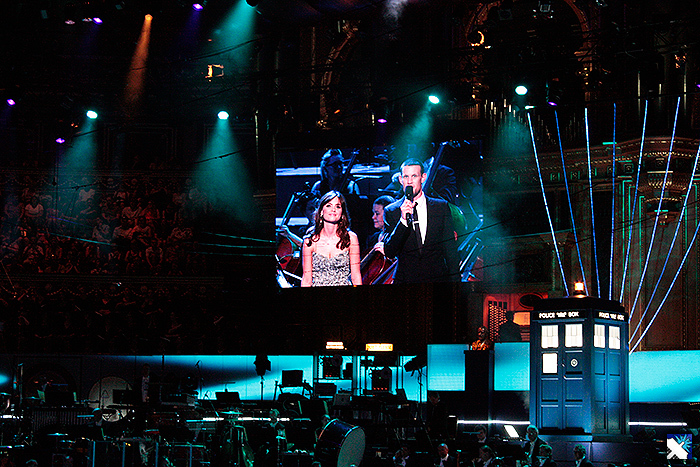 Matt Smith was welcomed back on stage, (now out of his Doctor's costume) to introduce the tenth piece of music for the evening; 'The Impossible Girl', which was dedicated to the most recent companion, Clara 'Oswin' Oswald. The room fell silent as Gold's delicate notes from this beautifully melodic piece filled our ears. The next, slightly unusual, but welcomed choice of music was 'La Fille Aux Cheveux De Lin' (The Girl With The Flaxen Hair), introduced by the Impossible Girl herself, Jenna-Louise Coleman. 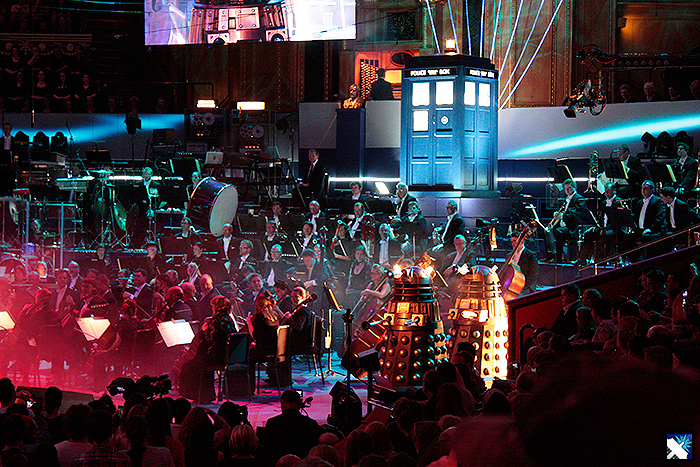 Like Toccata from Part One of the Prom, this piece of music was used in the Classic Series in 'The Robots Of Death' and was reimagined in 1973 by Doctor Who composers Dudley Simpson and Brian Hodgson. Ben Foster orchestrated this version which offered a brief pause from the straight Doctor Who setlist. The twelfth selection of music was introduced - much to the welcomed surprise of the audience - by Peter Davison (The 5th Doctor). Davison commanded the audience with his comedic brilliance by opening with "wow, what amazing memories you all have - even though most of you weren't even born". 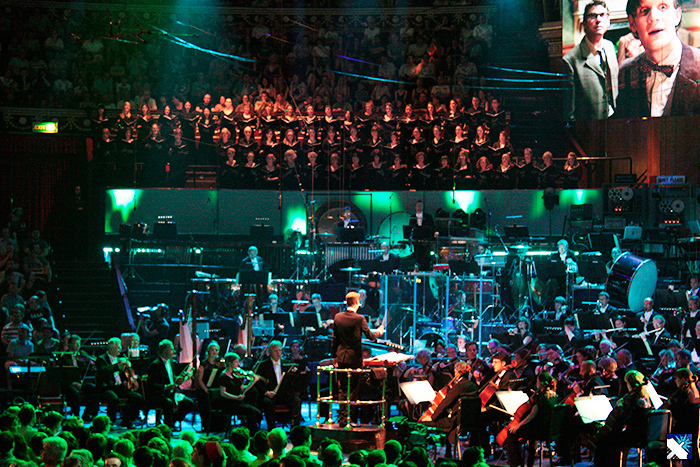 This section was one of the many highlights for us as it showcased some of the stand-out scores from The Classic Series, re-imagined and arranged by Mark Ayres and Orchestrated by Ben Foster. Featuring sound effects by Brian Hodgson and music from 'The Daleks', 'The Tomb Of The Cybermen', 'The Sea Devils', 'City Of Death', 'Logopolis', 'The Five Doctors' and 'The Curse Of Fenric'. 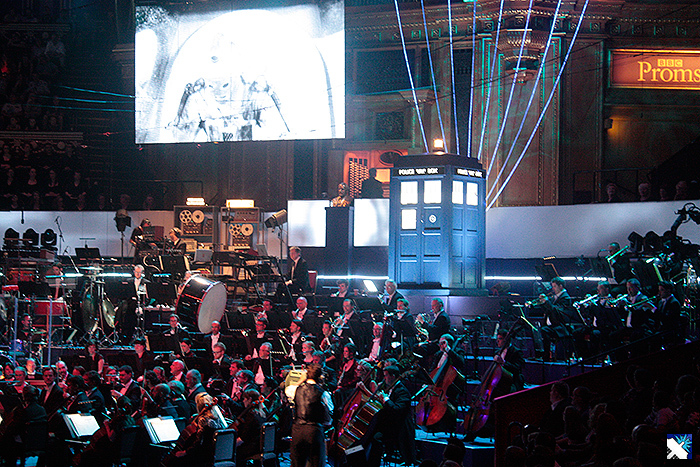 This was a true celebration of the 50th Anniversary of Doctor Who as each piece of music seamlessly blended into each other with symphonic grandure. We watched stand-out scenes on the screens as the reimagined scores were played out on top of them. Mark Ayres was definitely in his element and his section of the stage looked like a snapshot from the classic days with reels turning in the background. There was also a little cameo from Doctor Who brand manager; Edward Russell operating a vintage BBC camera! We would definitely champion for a standalone soundtrack to be released with these and many more Classic Series pieces, so listen up Silva Screen! Breathtaking stuff! 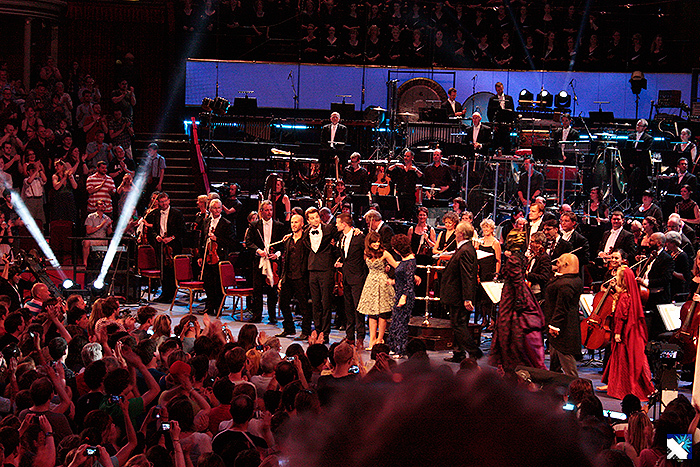 Vastra and Strax returned to introduce the 'Doctor Who Create A Soundtrack Competitions Winners' section, where two age groups (14-16 & 11-14 year-olds) were given the chance to create their own soundtrack to scenes from the Doctor Who Christmas Special 'The Snowmen'. First up were the winners from the 14-16 year-old age group; Gabe Stone and Matthew Owen from Gloucestershire. Next were the winners from the 11-14 year-old age group; William Davenport and Jordan Picken from Stoke-On-Trent. It was a nice change of pace to offer a portion of the schedule to the younger fans, who produced two, very different but surprisingly good scores. Needless to say all four received a well-deserved round of applause! 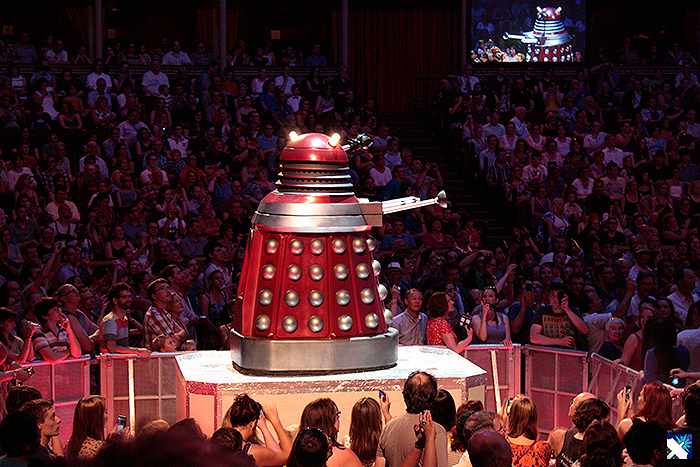 The Daleks (with a little help from Nicholas Briggs' vocal talents) took to the stage for the next segment, titled; 'First There Were Daleks'. After some fun pantomime-style audience participation, the next few minutes celebrated The Doctor's most famous enemies, with selections of Murray Gold's Dalek related music from Series 4 and 7. 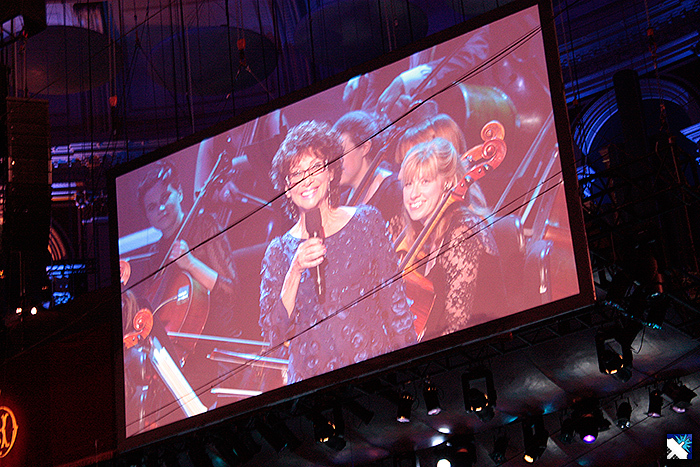 With the introduction of the penultimate item on the schedule came another surprise guest as Carole-Ann Ford (Susan Foreman; The Doctor's Granddaughter and first ever companion) took to the stage. 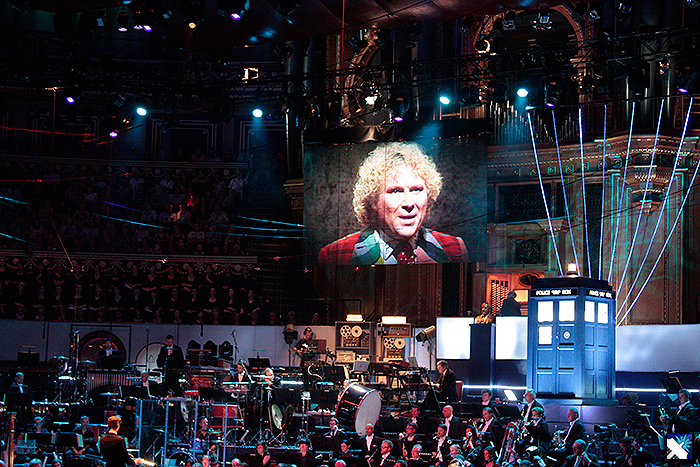 Ford's words were filled with love for the show and its tenure as she introduced a piece of music from the final episode of Series 7 of Doctor Who; 'The Name Of The Doctor'. As I stand here waiting for my time to come, I follow in your footsteps, I follow when you run. From the jaws of disaster, from a planet besieged by deadly ancient foes. And as we stumble down our slow road I can't but wonder what would fit be like. To run away with you through time, where would we go who might we find. But on we go, cutting our paths, only one way, one day at a time, while you embrace the universe, spinning your way on the fast road, limitless endless. So my dear friend you're getting kinda old now (or maybe we are). And now our children watch you do the deeds we marvelled at wondered at. From the jaws of disaster, from a planet besieged by ready ancient foes. It's not the end yet there is no end. Fumbling and bumbling while all around is crumbling and stumbling through time like you're a mad man still it's humbling to watch you reconcile divergent creeds without succumbing to the lure of weapons, force or greed you only use intelligence and jokes and charm. Once again, this was a beautifully crafted piece by Gold, whilst intelligently pitching a perfectly wonderful way to celebrate 50 years of Doctor Who. Matt and Jenna returned one last time to ask "Who would like to hear some more? ", to which there echoed a resounding yes from every audience member. 'Vale Decem' was the song of choice to and featured footage from each of the doctor's eras with regeneration being the main theme. 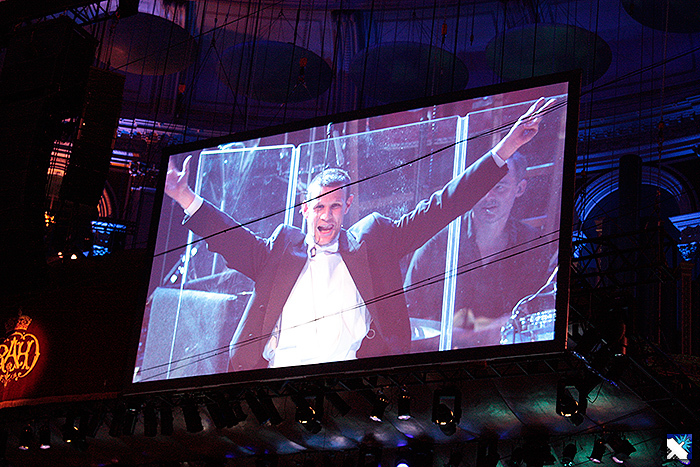 One last treat was Murray Gold's most recent version of the Doctor Who theme to close the evening's celebrations. A standing ovation saw Murray Gold, Ben Foster, Matt Smith, Jenna-Louise Coleman, Peter Davison, Carole-Ann Ford, Neve McIntosh, Dan Starkey, Elin Managan Thomas, Allan Clayton and Kerry Ingram return to the stage to take their well-earned bows. As they all left the stage for the final time, Smith and Davison walked off with their arms on each others shoulders in a wonderful display of support and admiration for each other, closely followed by Ford and Coleman. It somehow summed up the whole event; Classic meets New with one supporting the other. Kudos to all the actors who wore thick padded costumes in the stifling heat of the Royal Albert Hall, helping to make everything in this extraordinary experience, come to life. Likewise to Nicholas Briggs with his endless CV of monstrous voices. A huge nod to Ben Foster, who's boundless energy and bouncy hair (that always returned miraculously to its starting position) brought extra life to the whole performance. And finally, to Murray Gold, whom Doctor Who is incredibly lucky to have had working on every episode since its triumphant return in 2005. Murray is a true musical genius; not just a composer, but a writer, an orchestrator, a dramatist - a fan! 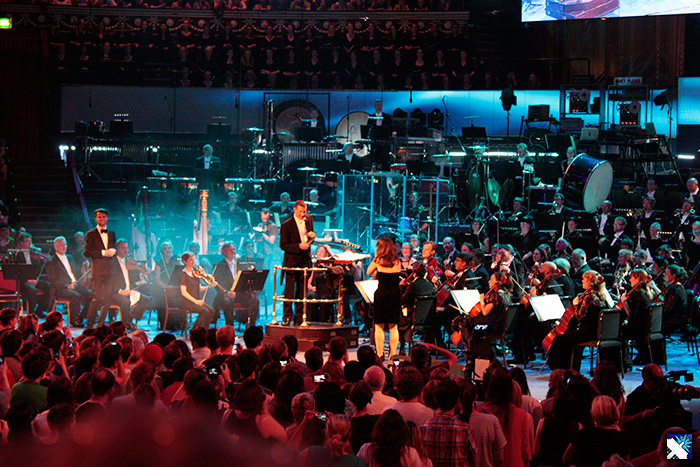 Seeing, or rather, hearing a tiny selection of his work at this Prom was an eye-opener to just how much he has produced for the show over the past 7 years, and the partnership with Foster's orchestration is a professional marriage that we hope will continue to be at the backbone of Doctor Who for many years to come. 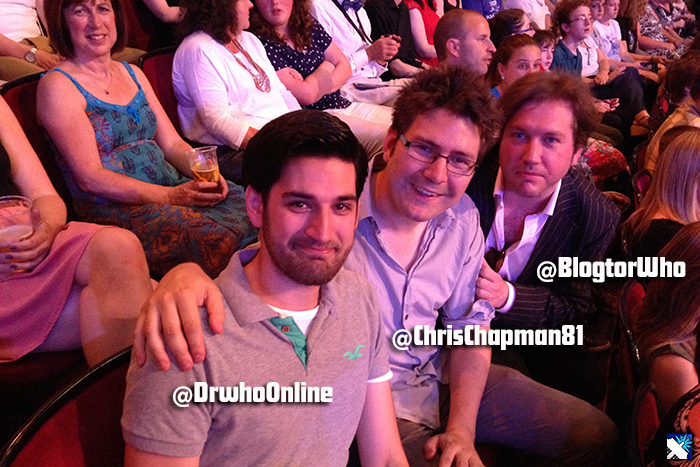 This was a truly fantastic and eternally memorable evening and the perfect way to celebrate The Doctor's half century!